The historical summary in the previous chapter may seem remote and not our doing. It happened a long time ago, and there isn’t anything we can do about it. But as you’ll see in this chapter, people continue to make decisions about whether or not to change forest ecosystems. What could bring thousands of protesters to a rural area in Northern California, where lumbering has been a way of life for more than a hundred years? In brief, it is a particular area of privately owned old-growth redwood trees that are now scheduled to be logged. Towering more than 300 feet high, and 18 feet or more at the base, some of these giant trees have been growing since the birth of Christ. The rich ecosystem of the Headwaters Forest is home to the Northern spotted owl, bald eagle, Coho salmon, and other endangered species. Although the contested grove covers just 3,000 acres, the Pacific Lumber Company—which owns the forest—claims the giant trees are worth $700 million. While the overall forested regions in the United States are no longer shrinking, old growth forests have dwindled to just a few percent of what they used to be. The controversy is whether or not these remaining old growth forests should be logged or not. There are valid arguments on both sides. In this chapter, you’ll hear about the controversy from the point of view of the wood products industry, environmentalists, and a U.S. Senator. The case for cutting old growth redwood trees in the Headwaters Forest rests on several arguments. The following information is from a series of pamphlets and articles produced by the Western Wood Products Association in Portland, Oregon. Wood is a renewable resource. Nearly two billion trees are planted each year, mostly by the wood products industry. Unlike coal and oil, which cannot be replaced, trees grow back. Wood reduces our need for coal, oil, and gas. For example, steel, both new and recycled, uses 4,000 times more coal, oil, and gas in its refining, manufacturing and fabrication process, start to finish, than wood. Wood is a good insulator. A building made of wood looses less heat to the surrounding air than a structure made of other materials. Wood’s capability to insulate is 8 times greater than concrete, 413 times greater than steel, and 2,000 times greater than aluminum. Wood absorbs carbon dioxide from the air. When coal, gas, and oil are burned, they release carbon dioxide into the air. Carbon dioxide traps heat, and many scientists believe that this is causing the climate of the Earth to warm up. Fast-growing tree plantations absorb carbon dioxide at a much faster rate than old growth trees, which have reached maturity. Consequently, replacing old growth forests with tree plantations will slow global warming. Harald Berndt has a Ph.D. from the Forest Products Laboratory at the University of California at Berkeley. He explained the advantages using old growth wood. The Pacific Lumber Company, which owns the Headwaters Forest, defended their decision to begin logging operations in a series of publications. Following are some of their major arguments. We have already donated nearly 20,000 acres of our lands for use as public parks. “The Pacific Lumber Company provided the land along the Avenue of the Giants” north of Dyerville, California, and donated or sold lands for other public parks as well. Marbled murrelet. By U.S. Fish and Wildlife Service, via Wikimedia Commons. The following is from Communication Works of August 1997 and other Headwaters materials. Use is courtesy of the Headwaters Sanctuary Project. “The ancient groves of Headwaters Forest display the most outstanding characteristics of the delicate redwood ecosystem. Today so little of the old-growth redwood forest remains that every bit is precious, both for wildlife living there and the future viability of the ecosystem as a whole. Why the Fuss Over A Few Big Trees? “In little more than a century, the two-million-acre ancient redwood forest system has been cut down to a few scattered islands. Headwaters Forest contains the largest unprotected ancient redwood forest left in the world. It is a remnant of a once-abundant high-elevation ancient redwood forest. As such, it is a critical area for species which need that forest type for survival. The marbled murrelet, a seabird that nests on the large limbs of ancient trees, depends entirely on Headwaters and only two other places in California. The coho salmon, whose numbers have drastically declined the last few decades, need the cold clean water that filters from this ancient forest. It is estimated that five to ten percent of the remaining wild coho salmon in California spawn in drainages that flow from Headwaters Forest. “Redwood is one of the fastest-growing tree species, but a forest is much more than trees. Redwood forests develop the greatest volume of living matter per acre on Earth, as much as ten times that of tropical rain forests. Redwoods grow two to three feet per year under ideal conditions, reaching a canopy height as high as 367 feet in 200 years. “As they age, redwoods’ thick bark and lack of resin make them almost entirely fire- and insect-resistant. Venerable elders among us, redwoods can exceed 2,000 years of age. “Redwood trees have shallow root systems that penetrate only about six feet into the thick forest floor while spreading out 60–80 feet and intertwining to anchor themselves against heavy winds. For this reason, redwoods are extremely vulnerable when isolated in roadside stands or fragmented by logging. Headwaters Forest. By U.S. Department of the Interior, Bureau of Land Management, via Wikimedia Commons. “Ancient forests have evolved over millions of years to reach a climax state with individual trees more than a thousand, even two thousand, years old. A multi-layered canopy, a mix of tree species and ages, large standing dead trees (snags), and fallen trees comprise the basic structure of the ancient forest. The complex interplay of plants and animals—the ecosystem— depends on these diverse elements. Industrial forestry destroys this biological diversity by reducing the landscape to an impoverished simple state, single-species, single-age tree farms. “Current industrial practices in the redwood region promote an average rotation age (cutting cycle) of 40 years or less. Redwood doesn’t even begin to acquire its desired rot-resistant properties until it is approximately 80 years old. And powerful carcinogenic pesticides, routinely used in clear cut areas to kill brush and hardwoods, leach in the water table, polluting the groundwater and killing fish. The following is from an article by Sen. Dianne Feinstein, which was published in the San Francisco Chronicle on October 7, 1996—©San Francisco Chronicle. Reprinted with permission. Ten years seems like an eternity to those of us who have participated in what seemed like an endless debate over preserving the Headwaters Forest. Yet it is merely a fraction of time in the 2,000 year life of the magnificent redwoods over which this increasingly pitched battle has been waged. In the decade-long standoff, no solution has ever been within our grasp. Two statewide bond initiatives on the ballot that would have raised funds to purchase Headwaters were rejected by California voters. 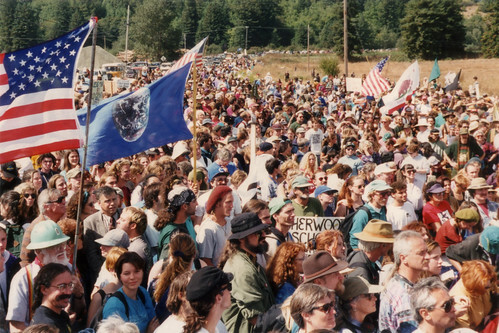 [In 1990, California voters turned down a ballot initiative to buy the Headwaters Forest. It was a close vote: 47% in favor; 53% against.] Federal legislation to acquire the Headwaters failed as well. The State of California says it has no legal recourse to prevent Pacific Lumber from logging its own property. And, after staying out of the Headwaters for 10 years, Pacific Lumber made it clear that the company intended to begin salvage logging immediately after the marbled murrelet nesting season ended two weeks ago. Prospects for a resolution certainly seemed dim as the logging date approached. Against this backdrop I was asked a month ago to help move the negotiations forward. After more than 100 hours of intense negotiations, a tentative agreement was hammered out for the federal and state governments to jointly purchase the most sensitive areas of old-growth redwoods—the Headwaters Forest and Elkhead Springs Grove—and enough surrounding acreage to protect these fragile ecosystems, nearly 7,500 acres. The price is $380 million in cash and/or assets. Is it everything the environmentalists wanted? No—they wanted 60,000 acres. This was not an obtainable goal; we couldn’t afford to purchase that much land. Is it everything Charles Hurwitz and Pacific Lumber wanted? No—they wanted substantially more money. They believe the Headwaters alone is worth in excess of $700 million. We couldn’t afford that. It is a compromise, and the agreement is as fragile as the ecosystem we are trying to protect. But it is important to understand that the agreement is a historic move forward. Not only does the agreement—if it is completed—protect the heart of the ancient redwood groves, but it is also the largest effort at habitat conservation in U.S. History. Under the tentative agreement, which was signed by the U.S. Department of the Interior, the State of California, Pacific Lumber and its parent company, Maxxam Inc., the federal and state governments will purchase 7,500 acres of forest. The preserve will include about 3,000 acres of old-growth redwoods known as the Headwaters Forest, 425 acres of old-growth known as Elkhead Springs Grove, plus an additional 4,000 acres of second-growth land to provide an environmental “buffer zone” around the most sensitive areas. In addition, Pacific Lumber will submit a plan for habitat conservation (known as an HCP) to the U.S. Fish and Wildlife Service in order to conduct logging within 205,000 acres of Pacific Lumber holdings in Humboldt County. The state requires a “sustained yield plan,” or SYP, as well. [Sustained yield means that the rate of harvesting does not exceed the rate of new growth.] The federal and state governments, for their part of the deal, must approve or deny the company’s HCP and SYP plans within 10 months. Some say a scientifically sound habitat conservation plan cannot be completed in 10 months. However, the Department of the Interior’s own guidelines specify that HCP’s should take no more than 10 months to complete, and the environmentalists are welcome to participate in the process by reviewing and commenting on any plan submitted by Pacific Lumber before it is approved. As part of the accord, Pacific Lumber has agreed not to conduct any logging operations, including salvage logging of dead and dying trees, in the 7,500 acre area during the 10-month period while the agreement is being finalized and the habitat conservation plan developed. What Will it Mean for Old Growth Forests? On November 14, 1997, President Clinton signed a bill containing $250 million to buy 7,500 acres in the Headwaters Forest. This fulfilled the federal government’s part in the agreement to preserve some of the ancient redwoods owned by The Pacific Lumber Company. The next step is up to the State of California. California’s Governor Wilson offered several large parcels of forested land in exchange for the old growth forests owned by Pacific Lumber, but these offers were turned down. The next step will be to ask California voters if they are willing to pay the additional $130 million to complete the deal. Given that the voters turned down an opportunity to buy the Headwaters grove in 1990, the results are by no means guaranteed. What will it mean for the wildlife that lives in the remaining old growth forests when these forests are logged? How will the soil and climate be affected? How will it affect the fish in rivers and streams that flow through the forests? Unfortunately, no one has final answers to these and related questions. However, you’ll see in the next chapter that scientists are hard at work trying to find the answers. It is time for an election in California. Write a Letter to the Editor of a California newspaper urging people to vote for or against using $130 million of taxpayer dollars to complete the Headwaters Agreement. In composing your letter, be sure to answer the following questions. a. What is your message? That is, do you want people to vote “For” or “Against” paying $130 million to The Pacific Lumber Company to preserve the forest? b. Why is this vote important? In other words, what principles do you think are at stake here? c. What do you think should be done about old growth forests and why?